And to so our final day in Adelaide. After breakfast we packed up all our stuff and checked-out, leaving the big backpack with reception to pick up later. Then we moseyed down North Terrace, passing the South Australian Parliament building, where Mcleod’s Daughters was being filmed for, as the Adelaide Advertiser reported, “a storyline where the farm is under threat again”. We were headed to the Adelaide Museum, which to the delight of this tourist with his rapidly draining wallet and bank account, is free to enter. We were a few minutes early for the 10am opening time, and had a sit-down outside, watching the people and the traffic nearby, and the growing numbers of young school kids also preparing to visit. We shot in as soon as the doors opened, before the school parties had time to organise themselves. First stop was the ground floor World Mammals exhibit, a very interesting display of (stuffed) animals, as well as Max the Human Skeleton, who had left his body to science when he died in 1913. We cut that short when the first hordes of school kids tramped in, and went upstairs. 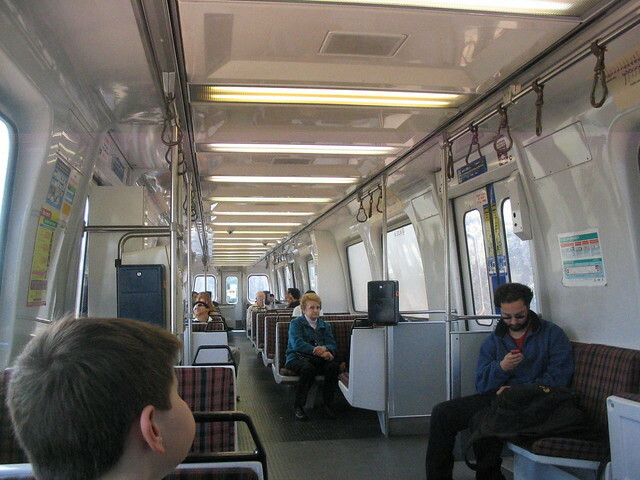 Adelaide’s trains are all operated by diesel railcars. This one looked uncannily like an unrefurbished Melbourne Comeng train inside, and it was no surprise to learn later that they were in fact built by Comeng. The seats and walls were very clean compared to Melbourne’s trains, though some of the windows were a little difficult to see out of. But first there was breakfast. We went down to the ground floor cafe/restaurant/thingy, the jawdroppingly inspiringly named “Cafe 31” (‘cos the hotel is at number 31 in North Terrace). The kids decided to run the two storeys down the fire escape, racing against the lift — something they continued to do for the rest of our stay. On the way down, they’d usually beat it (it was a pretty slow lift). On the way up, the lift would usually beat them. Looking through last year’s trip entries, I note the full buffet breakfast at the Travelodge in Sydney was $16.50 for adults and $7.50 for kids, which I thought at the time was a bit pricey, but ultimately worth it. Here? $18.90 per person, with no discounts for kids. $56.70 for breakfast?!? Yeeeeouch! I know, I know, you’re paying for the convenience of it all. We paid up this once, but I vowed to restrict us to the Continental breakfast the next day. Not that it wasn’t tasty, but jeez. I made sure to grab a complimentary newspaper to try and get my money’s worth. After fuelling up we headed out. First we walked up to Rundle Mall, looking for the market. Eventually we found it at the point where Rundle Mall becomes Rundle Street (but before it becomes Rundle Road… who was Rundle, anyway?). The market didn’t look like very much we couldn’t find at the markets in Melbourne. Besides, handcrafted stuff bore my kids stiff, no matter how nice it is. And frankly I’m not that enthralled myself. So we backtracked to the Avis car rental place I’d booked with, back on North Terrace. The Avis lady behind the counter seemed a little stern and business-like, but I expect I would be too if I had to work from 8am on a Sunday morning. She said we’d got an upgrade (I booked a Corolla, we got a Yaris; what a silly name) and gave me the key and the directions to the carpark, which was a couple of doors up. With last year’s trip to Sydney very much the model for this year’s little jaunt, we set out on Saturday morning. Train (on-time this time) then the Skybus to the airport. This time Virgin Blue got the gong for the best deal on flights, so we checked-in then dropped off the bag. The video on the Skybus had mentioned a ban on liquid containers on planes, with the implication that our big opaque water bottles (all three promotional give-aways from banks) would be seized by airport security and disposed of in a controlled explosion (or something like that). So I’d emptied them out and put them in the checked luggage. Of course, this left us paying $3 for a bottle of water inside the terminal… ah well. We also bought gum, traditional attempted remedy to the ear problems when ascending and descending (though I’m not convinced it helps that much). After Marita spotted Max Walker in Mildura airport last week, I was on the lookout for celebrities. I didn’t spot any, though I did see an ex-girlfriend and (I think) her sister boarding a flight to Sydney. We had a quick couple of goes at the Simpsons pinball machine (annoyingly quick, in fact) before boarding. We landed and got to walk across the tarmac like rock stars. I adjusted the time on my phone, then we picked up our baggage. While we waited, someone else’s suitcase fell off the carousel taking a sharp corner. Nobody else seemed to notice it, so we put it back on, so whoever owned it (obviously waiting out-of-sight of it) wouldn’t be standing there all day waiting. How come people so often decide to ring me at the same time? Often the phone won’t ring all day, then I’ll get a call and when I get off the phone, I find someone else rang and left a message at just the same time. Seems to happen with SMSs too; it never rains, it pours. Anyway, off to Adelaide tomorrow. Will update via Twitter if I can be bothered. Avagoodweekend. PS. Wednesday. Back. Had a good time. Will be posting about it in way-too-much detail over the next few days.